Find the youtube link here https://www.youtube.com/watch?v=vHqk4qSl_hA! The music conversions are great! Made my evening! Thanks for ensuring that our beloved Atari was present at this event! blast processing on the atari! Bigsprites ftw! The downfall of scrollers indeed has to be stopped. Also nice Loveline, gfx & msx - rocked at Deadline! Why graphics credits to Modmate??? 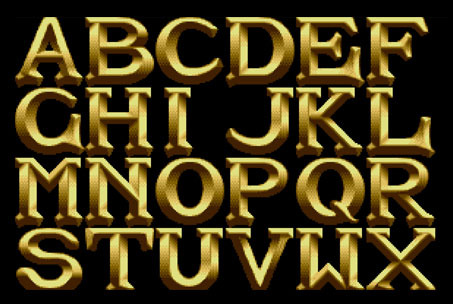 Only graphics are 3 fonts and the 3 fonts are old and famous ! Mainly because he supplied them to me, and I assumed them to be off his hand. Could you direct me to the originals? Another happy day for the atari scene. I have no time to find the original fonts but 200% sure it was ripped. To get back at your comment, yes I have heard of an incident regarding crem using other peoples work, and from this I learn that its required for me to check supplied graphics to me actively with the supplier to verify whether or not its original material or not; and I will. To prevent future situations like this. Let me be clear here that by no means I intend to make any false claims of authorship. To reflect this, I will change the scroller and link a final version. Of course the customer is always right. In general however, ripping code/graphics/music with or without misclaimed credits are nothing new in the history of demoscening. (Same goes with hiding ones identity btw). No offense, I love your demos and I just wanted to warn you about that point. I was seeing your demo, reading the scrolltext then I read all graphics by C-rem!!! 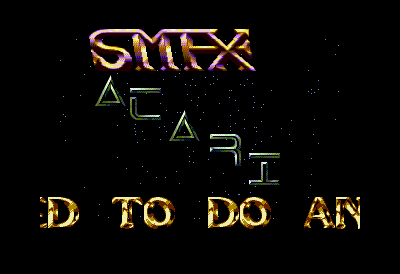 A small work of "construction" for the SMFX logo and finished. Anyway, that don't change my opinion about your code, it is great. I wish you the very best for you brilliant futur tikitikiST ! NOTE : Please dont answer you simply want me to do original GFX ... blah blah blah .. i've already heard this song ... i dont need any answer or moral support ... or candies ... but my back hurts me a little so .. why not a massage ? It was not a direct attack against you, I don't know you. Probably you are a very nice person. The only thing is I hate ripping. I understand it is more easy and fast but then you should not credit yourself for the graphics the original artists have worked hard to make. Sorry. Thumbs up for the drama. 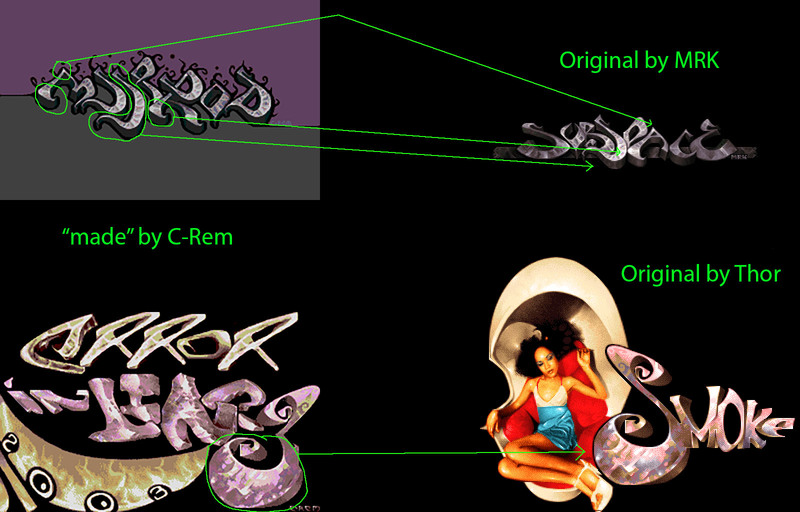 For the record, I wrote the scroller; c-rem never claimed anything regarding authorship of the supplied graphics. I did not check with c-rem, which I could have done in order to prevent incorrect scrolltexts! Not a biggest fan of this intro and its message - if avoiding demotools just to stay "true" (or whatever the exact phrase was) means making compofillers that look like this one (90's rang and wanted their intros back), then I'd rather prefer people who make their prods being "untrue". In other words, if you're saying big things in the scroller, make sure your prod stands up to them. For me it sadly didn't. No issues with the prod otherwise - it would've been just another filler, if the big message from the scroller hadn't been to heavy for it. Thanks for your feedback. I can assure you that most of your if cases do not hold true from the creators point of view. I think that things should not be taken too seriously and one should assume the best intentions; unless proven otherwise. That image was for sale in printed form (at least via the Breaking the borders book) and there's still a pledge for donations. Now you have the nerve to make a big fuzz over a few ripped fonts in a demo? I usually try to stay far away from these dramas, but.. argh. Draw original graf pixel by pixel on an old tv with atari mouse or die ! Actually, I might've taken this demo too seriously indeed, hence I hereby declare to withdraw my thumbdown! Good rate of pixels moving per vbl. Also excellent music, and good choice of ripped gfx.